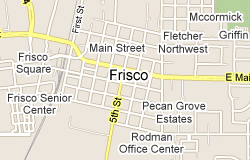 Frisco, Texas Real Estate and Community Info. If you like variety (and who doesn’t? ), then you’ll quickly fall in love with the homes for sale in Frisco, Texas. Here you find an amazing selection of homes priced to fit just about any budget, available in sparkling new developments, charming established neighborhoods and everything in between. Frisco could be the poster child for the real estate axiom that the three most important things are “location, location and location.” This cozy-yet-booming community of more than 139,000 is about 28 miles straight north of the Dallas/Fort Worth metroplex. This is far enough away to have a look and feel all its own, but close enough for residents to easily reach big-city shopping, dining and recreational choices. Ironically, many of the people who live in the greater Dallas/Fort Worth area choose Frisco as their destination of choice when it comes to shopping and dining. Frisco residents enjoy the convenience of having an all-inclusive, one-stop shopping destination in their lovely community at Stonebriar Centre. Here you not only have popular fashion retailers, such as Banana Republic, H&M, Michael Kors, Abercrombie and Fitch and the Gap right at your fingertips, but you also have fine casual dining choices, such as The Cheesecake Factory, Buca di Beppo, and California Pizza Kitchen. Perhaps nothing showcases Frisco’s high quality of life better than its Parks and Recreation Department, proud recipient of the Texas Recreation and Parks Society’s prestigious Gold Medal Award for Excellence in Parks and Recreation Management in 2007 and 2010. Come and experience for yourself the City of Frisco’s 36 park sites, which cover more than 1,300 acres and offer a diverse array of amenities and activities. These include everything from hiking and biking trails, batting cages and splash parks, to natural, undeveloped areas, urban forestry programs, fishing piers and more. Frisco has a playground for kids of all ages and interests. The city of Frisco’s slogan, “Progress In Motion,” aptly describes the town’s seemingly effortless blending of good ol’, down-home Texas charm with hip and stylish modern day conveniences. Sports lovers can follow the minor league Frisco Rough Riders baseball team, the Texas Tornadoes of the North American Hockey League and the numerous soccer games held at the Pizza Hut Park who is the official sponsor of FC Dallas. Lovers of music and the arts can bask in the warm glow of the Frisco community’s eclectic and creative offerings, including the Texas Sculpture Garden, a breathtaking private collection of indoor and outdoor artwork. Pizza Hut Park will also statisfy any music lovers craving for concerts. From Jimmey Buffet to Kiss and all kinds of country musicians in between, Pizza Hut Park hosts numerous venues throughout the year. Families with school-age children will want to check out the homes for sale in Frisco, Texas. The Frisco Independent School District incorporates 6 high schools, 12 middle schools and 30 elementary schools. The district enjoys one of the best reputations in the region, and with Amberton University, Collin County Community College and Dallas Baptist University calling Frisco home, students have excellent choices at every level. Healthcare options in Frisco include the Baylor Medical Center at Frisco and the 118-bed, acute care Centennial Medical Center, which also provides emergency services and offers a wonderful maternity center. Public transportation options for Frisco residents consist of several area Park-and-Ride sites, a Dallas Area Rapid Transit (DART) station in Plano and Vintage Coach Transportation.